There seems to be so many people with problems at the moment I thought I'd devise a little spell to give you a magical warm hug when you are feeling down, either physically or emotionally. 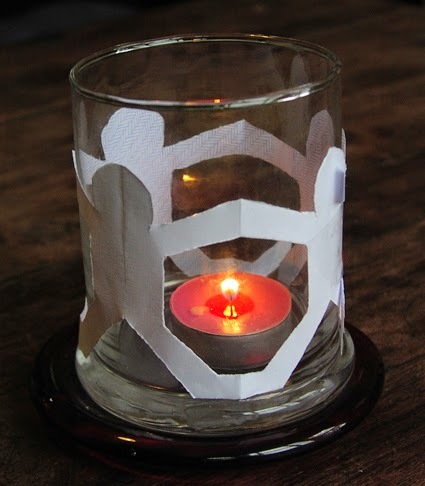 All you need is a tealight candle, a jar or glass candle holder and some paper. I picked a pink candle - to help me feel 'in the pink' - but you can just use a white tealight if you prefer. Find a clear glass jar or candle holder with plenty of room for space around the tealight then measure a strip of paper long enough to wrap around the jar. Cut a chain of paper dolls. The way you do this is fold the paper into pleats and then, with the paper folded, draw half a doll shape on the top fold, with half a head and body against one edge of the paper and the hands and feet touching against the other edge. Then cut out the shapes through all the layers of paper and unfold to reveal your row of dolls holding hands. If you like, you can draw or paint features and clothes on the dolls or you can just leave them plain. Sellotape the dolls around the outside of the jar or candle holder. Take the tealight out of its metal container for a moment and rub the candle between your hands a few times, then put it back into the metal container before putting it into the jar. Light the candle and visualise yourself feeling hugged and loved. If you want to scent the candle then give it a little spray of your favourite perfume or essential oil. Have the candle burning somewhere near to you and let the candle burn down completely if possible - but obviously don't leave a lit candle unattended for safety reasons. You can reuse your chain of hugging dolls and jar as often as you like, just pop a new candle in when you feel like a magical hug. There are more candle magic spells in my book Pagan Portals - Candle Magic.